When my mom and dad found themselves sitting in the NICU at Vanderbilt Children's Hospital having just learned hours earlier that their beautiful little boy had been born with congenital heart defects, there was one group that gave them support. Saving Little Hearts had a support group to meet in the hospital while I was there and they also provided mom and dad with one of their surgery packages. The package was great! 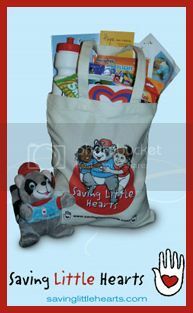 There was information on what congenital heart defects were, there was Ronnie the Raccoon (which we still have), some snack foods, calling cards, and alot more. The care package let my family know that somebody cared and that they weren't all alone. So now it comes time to support Saving Little Hearts. Saving Little Hearts has a chance to win $20,000 from the Chase Community Giving Program but we need everyone's help. All you have to do is go to http://apps.facebook.com/chasecommunitygiving/charities/10744266-saving-little-hearts-inc and click on “vote now." There are only 5 days left and if we can get into the top 200 charities we will receive $20,000 for surgery care packages. Please vote and ask everyone you know to vote. This donation will change the lives of so many families. We can't do it without you. Thanks for your help!